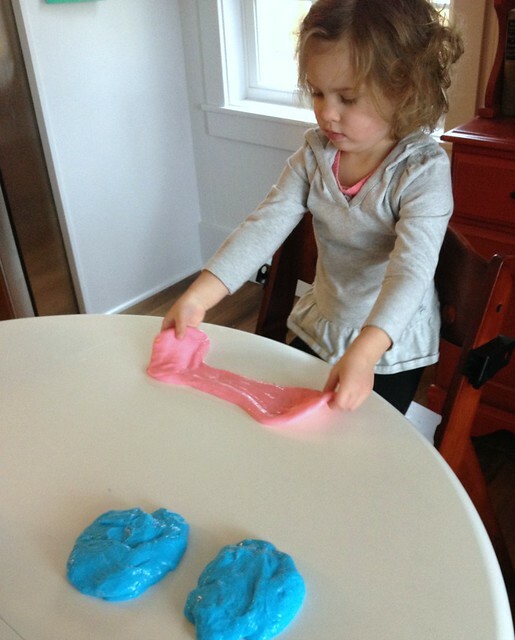 Several weeks ago, my mom gave Nora some gak (it’s kind of like super slimy playdoh). I was somewhat grossed out by it and figured it would make a huge mess, but Nora was THRILLED. She literally played with it for hours and hours and hours (by herself) which were hours and hours and hours I didn’t have to entertain her! A couple weeks later, when I was talking with Nora about what we could get certain people for Christmas, her main suggestion was gak. 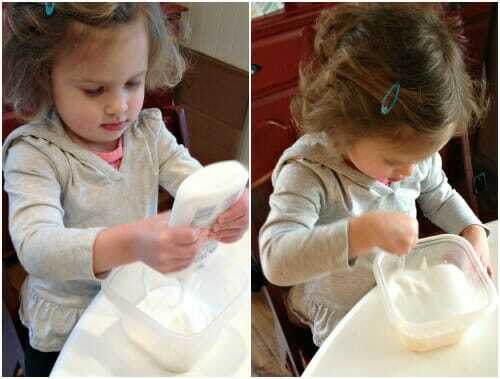 I steered her away from gak for grownups, but we decided that gak would be a good gift for a couple of her cousins. I set off to look for gak — and to my amazement, I couldn’t find it anywhere. Not in our grocery super-store, not at Target, not even at 2 of our local craft stores. I did find some on Amazon.com… but it was almost $20 for one tub of gak! I don’t think so! After little success finding reasonably priced gak anywhere around, I headed to Pinterest to look for a homemade gak recipe. Within 2 seconds I had hundreds of posts pop up — all with very similar recipes. I figured if THAT many people are making their own gak, it had to work. 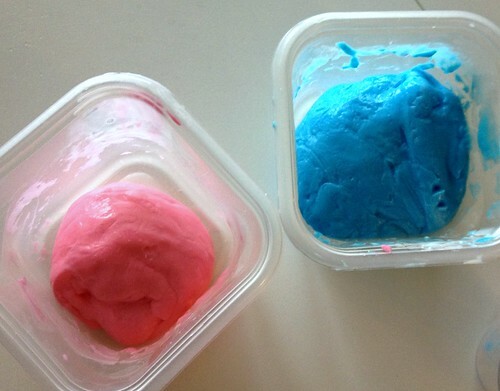 I’m happy to say that our gak experiment turned out perfectly the very first time! It took less than 10 minutes to make (even with me taking pictures), it hardly required any cleanup, and it cost less than $2 to make large balls of gak for Nora and her 2 cousins. I know many of you are looking for simple, frugal gift ideas for small people — or maybe just something to entertain your small people when they are home from school on Christmas break! 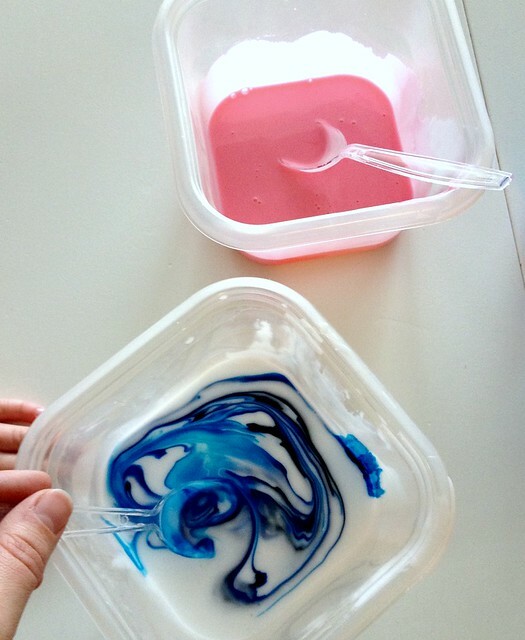 If either one of those scenarios describes your current situation, I would highly recommend taking a few minutes out of your day to make some gak — and yes, kids can help! In a separate small dish or cup, mix 1 tsp. 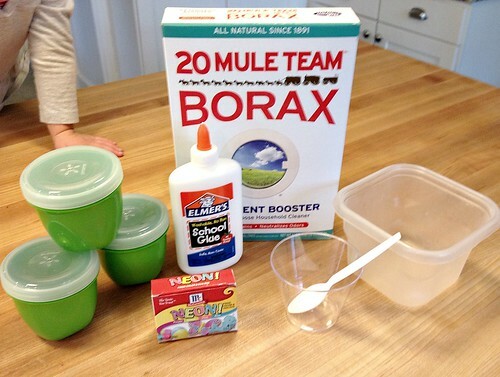 Borax powder with 1/2 cup warm water. Stir until dissolved. Keep stirring (or kneading with your hands) until all the liquid is absorbed and the gak is one large lump. I was honestly worried this little DIY experiment would make a huge mess of my kitchen — after all, I let my 3-year-old play with a whole bottle of glue! However, once the Borax powder comes into contact with the glue mixture, it instantly gels together and requires almost no cleanup. I used disposable food storage containers and plastic spoons/cups to do my mixing — so I just tossed them when we were finished. But honestly, it would have been very easy to wash them out if I had used my regular kitchen bowls. 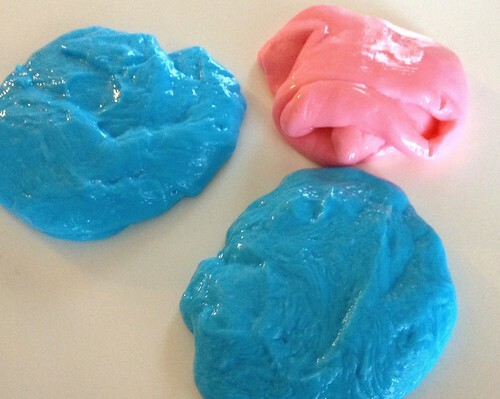 Oh, and in case you still have no idea what gak is, it’s a super stretchy, super slimy, putty-like substance that sticks to itself and rarely breaks off or crumbles (like PlayDoh). In my opinion, it’s the perfect craft medium for small hands! So who’s making gak over Christmas break?? I made this right after you posted and my kids still play with it. Today I attempted two more batches and both flopped – too watery or something! I used Elmer’s glue and everything. The first time I don’t think I mixed the glue and water well enough, so the second time I was very thorough with this step. I also made sure all the Borax was dissolved. What temp water have you used for mixing with the glue? I’m open to feedback. 😉 I don’t want to waste anymore glue. Hmmm… I’m honestly not sure. I think I just used tap water — probably room temperature, but I never really paid attention to it. I’ve honestly never had an issue making it so I really don’t have any great tips. Sorry! This is awesome! I “Pinned” it for next year. This year we made hot cocoa mix, last year gingerbread playdough and raindeer food the year before. The joy and pride on his face when he gives a home made gift is priceless! Thank you so much for this fabulous idea! Both my little ones (4 year old and 2 year old) LOVED it!!! Made it today and my almost three year old loved it. We hid marbles in it and he played with that for a long time. Thanks for all your great ideas! I can’t wait to make this the next time the grandkids come over. It looks like just as much fun to make is as it is to play with it. Hi Andrea! I definitely want to make this for my 5 and 2 year olds! What is the brand of the cute containers you got? Thanks! Thanks Allison! I got the containers from ePantry.com — but I think I have some Rubbermaide ones that are the same exact size (just clear instead of green) and I got those from the grocery store. What is Borax??? I would like to make but i have to find something similar here in Spain! I’m not sure where you’d find it in Spain. Might have to order it online? I think I may just make some gak this break. I’ve been putting it off for awhile, but I think the 2 year old may be old enough to understand not to put it in his mouth now. I would make this from time to time with my kids–it was always very popular! I look forward to making it one day soon with my 2 year old granddaughter. I always had to use Elmer’s glue–it wouldn’t turn out with the off brands for some reason. Yes, I had read that too — so I used Elmers and it worked just fine the first time!! Have fun making gak! I’m so glad you posted this! My daughter is in love with all things Gak and she’s always trying to make her own. She is going to be super excited about this! 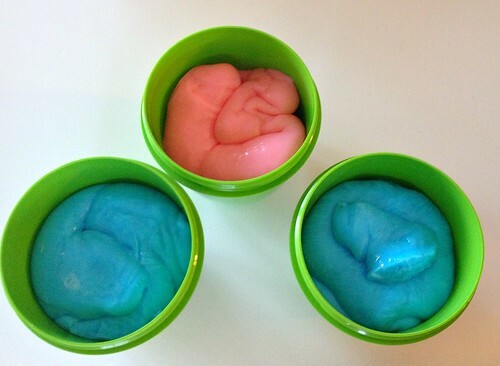 yay — enjoy your gak “experiment”!! My bonus daughter will LOVE this project! I can’t wait to try it out with her! Just what I needed to see this morning. Going to make it over break for sure! Fun! I bet my 3-year-old would love that. Also, Nora is just beautiful. Great idea! I am writing down all the ingredients to this right now so that we can make this while I am on break from work with my 4 year old! He is going to love this!!! definitely make it — we had so much fun and Nora has been playing with it every day. As far as the Borax — the thought never even crossed my mind! It’s just 1 t. and I did the mixing as she obviously can’t measure accurately yet.